In days of old, swords and daggers were the means to defend and protect one's rights and holdings, and all whom they loved. Sometimes when a sword was created, it was empowered by its maker, giving it a persona that both defined and complemented its master. It was an "extension" of the person who wielded it. Some were named and were even believed to have been enchanted, such as "Excalibur" the famous sword of Avalon, drawn from the stone and used by King Arthur. 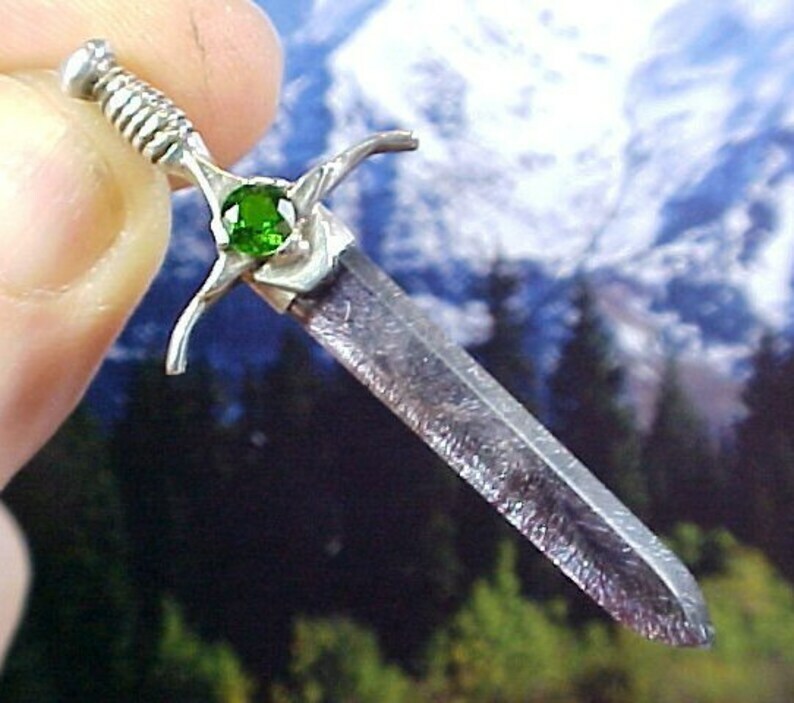 It was this wonderful story that inspired us to create this unique line of Swords Of Stone jewelry. From ancient through Medieval times, and into our living history of today, the sword has been found in many races and cultures and stands strong as a symbol of justice, honor and chivalrous times. Just as Archangel Michael, St. George and Lord Arthur used their swords to put an end to evil, bringing peace and justice into their realms, so do they each challenge us now to "take up the sword" and cut through all the "darkness" in our lives. In doing this we can open the doors to the abundance, peace and happiness that is already ours by Divine Right. With this ideal in mind, it is our hope that each of these "Swords Of Stone creations" find their way into the hands of those who would wield them with wisdom and compassion in the "quest" to bring total peace, love and enlightenment to Mother Earth and all her children. AGAPE CRYSTAL (which contains the energies of Amethyst, Smokey and Clear Quartz, Rutile, Lepidocrocite, Cacoxenite and Goethite) never needs clearing or cleansing and come only from Espirito Santo, Brazil. The name "Agape" comes from the Greek word meaning "an out-pouring of unconditional love" from above. After many years of working with these crystals, we have also discovered some rare crystals that have exhibited 5 other minerals as well. Agape Crystals are associated with an out-pouring of the Divine Feminine energies such as unconditional love, compassion, forgiveness, and healing, to name a few. The "brotherhood" of minerals contained within these crystals is not unlike our brothers and sisters of our Native American Medicine Wheel, all sharing their energies and gifts with their human companions to help them on their paths to spiritual enlightenment and completion. They can also help us to create a new path to allow the ways of "peace and harmony" to rule in our lives, and help us to re-focus and manifest all that is needed. In addition, these Agape Crystals can aid us in awakening, stimulating, and developing our psychic abilities, such as telepathy, clairvoyance, clairaudience, claircognizance and clairsentience. It should be noted here that even if some of these minerals are microscopic and not eye-visible within the stone, all of their properties are still within the crystal, as they are all indigenous to the area where these crystals are mined. Just like the minerals within Mother Earth that flow into the grape to produce its distinct flavor, so do these minerals combine to create this incredible crystal. Agape Crystal vibrates to the master number 11, the most intuitive of all numbers, representing illumination and deep insight, as well as spiritual harmony. DIOPSIDE can be found in many natural colors and can be used in stimulating the intellect while enhancing academic learning, providing major assistance in analytical and mathematic pursuits. It can promote humility and strength of character, and allows us to recognize our own strength during times of opposition. Chrome Diopside is a deep emerald green and is a strong gemstone stone for rejuvenating and revitalizing the energies of the heart, and aids tremendously in the emotional healing of the heart.